The UK population generally finds it difficult to talk about death and dying – including the healthcare community. 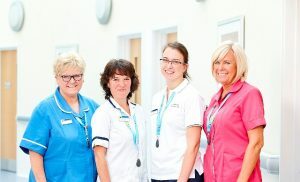 What we sometimes struggle to get across to our professional colleagues is that the Hospice has plenty to offer that can improve the quality of life for your patients and their families from the point of a terminal diagnosis onwards. A dementia carers well-being support programme to offer carers the opportunity to think about and plan their futures. We understand the difficulties around a terminal diagnosis very well and we’re here to help. Have you visited us? We run regular informal tours of the Sunflower Wellbeing Centre and the Inpatient Unit and you are very welcome to come and see all our facilities and meet our staff and volunteers. We are nestled in a quiet residential area of Macclesfield in a light, spacious and airy building with a surprisingly uplifting atmosphere that visitors often comment on. As a charity, all our services are provided free of charge to patients and carers – and we can work closely with you throughout to improve your patients’ quality of life. Please don’t deny them the opportunity to use our comprehensive services from the point of diagnosis onwards. We really can make a difference to all of you.